Mary “Sue” Moye, 77 years of age, passed away peacefully on Friday, June 15, 2018 at her home. Sue was born February 11, 1941 to the late Ethel Bradley and Joe Rhodes. She was one of eight siblings. Alice Kersey and Ethel Mae Crosley are still with us and five others siblings preceded her in death. Sue was a devoted wife, mother and friend. Sue leaves behind to cherish her loving memory, her husband of 62 Years, Joel Thomas Moye; children, Joel Thomas Moye Jr (Linda) and James Ray Moye (Sandra); three grandchildren: Brandy Miles (Gerry), Kristin Mitchel (Nick), Corey Schmid and four great-grandchildren. Family, friends, and others whose lives Sue touched are invited to the visitation from 6:00 p.m. until memorial service begins at 7:00 p.m. on Monday, June 18, 2018 at Trahan Family Funeral Home in Pensacola, FL. The Moye Family would like to thank all of the wonderful employees of Vitas Health Care (Hospice) for their care and support. You truly made a difference! 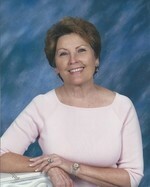 To send flowers to the family of Mary Sue Moye (Rhodes), please visit our Heartfelt Sympathies Store.